Clan-Gifts.com - Scottish Clan Names - Clan MacGregor Store! The clan claims descent from Griogar, a son of Alpin, king of Dalriada but some genealogists question this. The first chief was probably "Gregor of the golden bridles" and his son, Iain Camm, succeeded as 2nd chief before 1390. Robert the Bruce granted the barony of Loch Awe to the Campbells and this covered much of the land occupied by the MacGregors. As a result, the clan were confined to Glenstrae. In 1519 Iain of Glenstrae died without direct heirs and the Campbells supported the succession of Eian MacGregor (who was married to the daughter of Colin Campbell of Glenorchy). Eian's son, Alistair, fought at the Battle of Pinkie in 1547 but, following his death, Colin Campbell refused to acknowledge the claim to the land by Gregor Roy MacGregor. Gregor was forced to wage a guerilla war for ten years but was captured and killed by the Campbells in 1570. MacGregors were involved in the killing of John Drummond, the king's forester (after Drummond had hung some MacGregors for poaching) in 1589 and MacGregors took part in the Conflict of Glenfruin in 1603. With encouragement from the Campbells, King James VI and the Privy Council issued an edict banning the use of the name MacGregor. The clan chief was hanged at Edinburgh's Mercat Cross in 1604. Many adopted the name Murray, Graham, Stewart, Grant and even Campbell. The surname was not fully restored until 1774. In the 18th century there were disputes over the chieftainship but eventually John Murray (later MacGregor) of Lanrick was recognised. The MacGregors of Glengyle disputed this but eventually, following a petition signed by 800 MacGregors, the Lord Lyon recognised him as chief in 1775. Rob Roy MacGregor (he was forced to use his mother's maiden name Campbell due to the proscription of the MacGregor name) was a younger son of MacGregor of Glengyle. He took part in the first Jacobite Uprising in 1715. Afterwards, his raids on Lowland farms and his prowess with the sword earned him a reputation which was considerably enhanced by Sir Walter Scott's romantic tales. Rob Roy died peacefully in 1734 and is buried with his family in the churchyard at Balquhidder. A 20th century addition to his grave is defiantly inscribed "MacGregor Despite Them"! The MacGregor chief, Sir Evan MacGregor, played a prominent part in the visit of King George IV to Scotland in 1822 and he and his clansmen guarded the honours of Scotland (changed days from their former role as outlaws). And it was Sir Evan who had the honour of proposing the toast to the "chief of chiefs" King George, at the royal banquet in Edinburgh. The MacGregor clan motto is "'S rioghal mo dhream" which means "My race is royal" and refers to the claim that they are descended from Griogar, a son of Alpin, king of Dalriada. Despite its persecution and proscription, MacGregor is found frequently in Scotland. It was the 82nd most frequent surname at the General Register Office in 1995. Surnames regarded as septs (sub-branch) of the MacGregor clan include Black, Bowers, Bowmaker, Brewer, Caird, Comrie, Dochart, Docharty, Gregorson, Gergory, Greig, Grier, Grigor, Gruer, Leckie, Lecky, MacAdam, MacAra, MacConachie, MacGrewar, MacGrowther, MacGruder, MacGruther, MacLeister, MacNee, MacNeish, MacNie, MacNish, MacPetrie, Malloch, Neish, Nish, Peterkin, Petrie, Skinner, Stringer, White, Whyte. 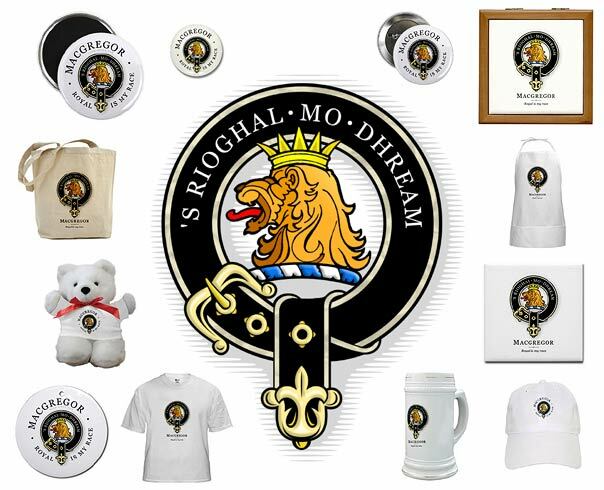 At Clan-Gifts.com we offer a wide range of quality Scottish gift Items, souvenirs, apparel and housewares, all printed with a beautiful rendition of your authentic Clan MacGregor crest! Our Clan MacGregor gift store stocks over 70 products*, and all items are fully guaranteed! Our great prices, low shipping costs and excellent customer support make us an excellent choice for Scottish Clan MacGregor merchandise!